And now we present the award for best character of the year. The options this year were as interesting as they were broad, and narrowing down our list just to the nominees was painful enough, let alone the brow-furrowing which went into narrowing it down to a victor. Here are the nominees for 2013 character of the year. 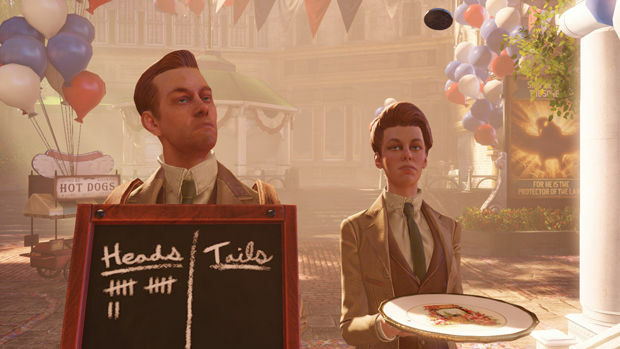 A pair of smug, trans-dimensionally weary scientists central to the events in BioShock Infinite, the Lutece Twins proved themselves to be the most memorable characters of the year for us. Constantly appearing to provide assistance, yet seeming somewhat bored in spite of the chaos surrounding them, the duo's casual disinterest in unfolding events gave a quirky charm to the often bombastic game. Their puzzling interference in events makes them utterly fascinating, and the year was much better for them. Congratulations to Irrational Games for their fine work. For our community poll, you all voted for the Narrator from The Stanley Parable as character of the year. He was followed by Ellie from The Last of Us, and Drippy from Ni no Kuni: Wrath of the White Witch.